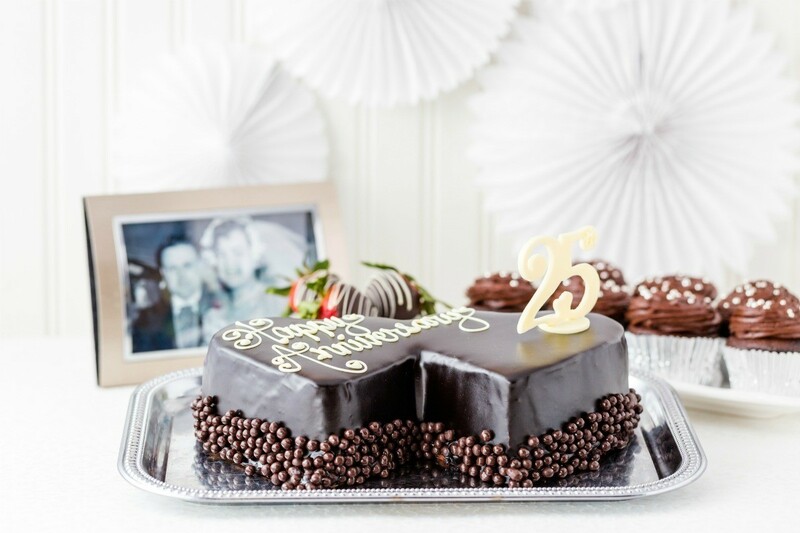 When planning a celebration for a couple's 25th year of marriage, you want to create a meaningful occasion. This guide contains 25th anniversary party ideas. We are planning our 25th anniversary party for the end of October. It will be for about 80 people, and will cost about $100. Our church will allow us to use the basement for the celebration. I plan to have quilt squares cut out for our guests to sign, and later I will make them into a quilt. Our decorating theme is Fiesta. A friend lent me her serape to hang up. The dollar store had some cute Mexican-style piggy banks in sunny colors; they also had honeycomb paper pineapples and toucans. I bought some streamers in complimentary colors to make flowers from. I will also make some miniature (ornamental only) burro pinatas to add to the table centerpieces. For food, I am taking advantage of our apple tree to make and freeze apple pies ahead of time. Since we raise our own beef, there will be beef tamales. I will also make a shrimp and tomato salad, hot rolls and butter, and whatever else sounds good. Fruit punch from our apple trees and some frozen juice concentrate will be the drink. We will feed about 40 at the meal, and then invite everyone else to the reception, since I don't think our budget will feed all 80. I am printing the invitations on some neat pre-printed paper I found at the dollar store. They can be folded, addressed and mailed without an envelope. Still need some games, though. 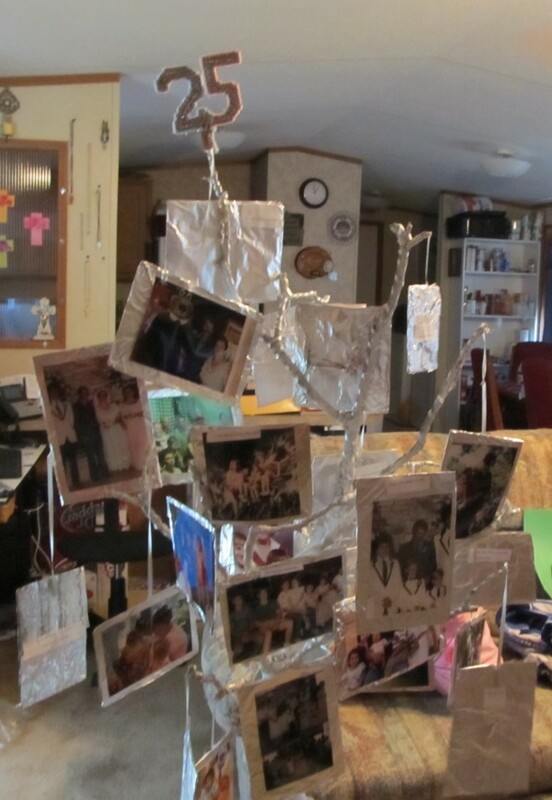 For a 25th anniversary party, I made a memory tree. To make it, I took a few branches from a limb my husband cut, attached them together with Elmer's and hot glue, then wrapped the bottom with white ribbon. I painted the smaller branches with white paint. 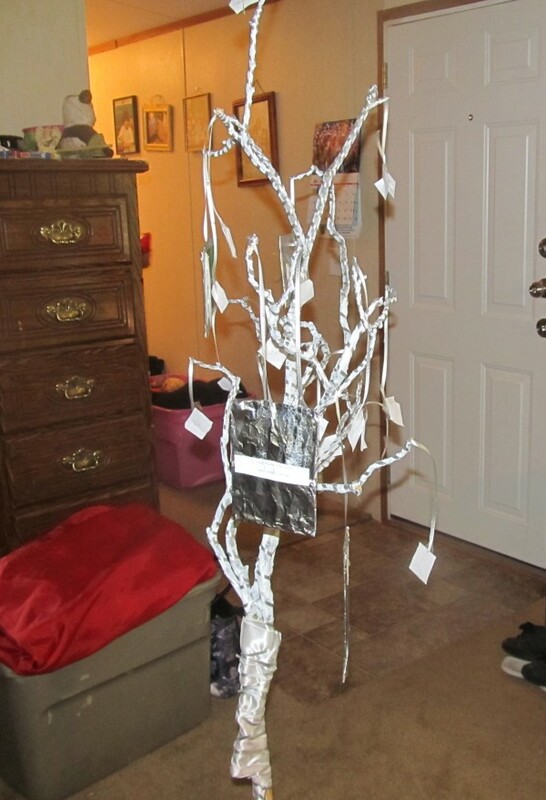 I then wrapped it all in sliver twirling ribbon. I finally affixed white ribbons to all of the branch ends, and from these I attached photos from engagement and all the fun times the family has shared in the past 25 years. These were attached to silver covered card stock, and then hung from the white ribbons. I made a 25 from plastic canvas and attached it to the very tip. My first photo is work in progress, the other is finished tree. I'm having a 25th wedding anniversary and I don't have the slightest idea what happens at an anniversary party. I am not sure if games are played, or first dance, or skits? Please give me ideas. Is there a list of what to do from start to beginning? It's your party, you can do whatever you want. However, a couple's kids are the ones that usually put it on, and the ones that I have been to, in my 73 years, are open houses, where they serve some kind of sandwiches, cake, coffee, tea, and punch. They have guest book with somebody sitting their just like at a wedding reception. The ones that I have been to, are usually held in church fellowship halls, so no dancing, some have even been held in parks(you have to reserve the area of the park)that you want to use. Also some people have an old fashioned bar-b-que in their back yards. This would have to be by invitation, but the but the ones that are held in halls and parks could be open house, either way you wouldn't have to worry about entertainment. The object of the ones I have been to, is so that people can come and go, the guests have an opportunity to visit a little bit with the honored couple. The Anniversary Parties I have attended have all been "come and go" parties, where guests drop in between certain hours, as stated on the invitations, and stay for as long as they want, partaking of a buffet of foods and beverages. The foods are usually fancy sandwiches, salads, cheeses, pickles, and dainties. The beverages are usually non-alcoholic punches, coffee, and tea. The best parties have lots of photos of the Anniversary couple and their children, starting with the couple's wedding photos, and continuing throughout the years. These can be laid out on tables and covered with plastic, to prevent spills, or posted on easels. It's best NOT to have photo albums, as they get dropped, and the pictures fall out. A slide show is great, if you have the technology. I'm trying to plan my 25th wedding anniversary. We will have a church renewal with a reception. My colors will be silver and black. I need ideas with finding a silver wedding gown, finding an inexpensive reception hall. Anybody who is planning or just had a 25th renewal? All ideas are welcome! You don't need an actual silver wedding gown, you could get buy with a silvery evening gown, prom dress. But if silver is what you really want; here is a cool link. You can perhaps get some wonderful friend to make a dress for you, out of silver, or get a nice black dress and embellish with silver here and there. You can find all kinds of cool silver things at the Dollar Tree now, and not all of them are for Christmas. Ribbon is there, too! You can cover black table cloths with silver glitter, then fold them toward the center when done and dispose of without much vacuuming. Silver bells, garland, and more can be found just about anywhere right now. White guest books with silver lettering are always at Michael's Crafts, and silver hair items can be found at thrift shops and DT, too! 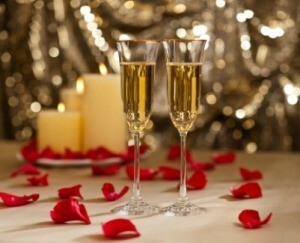 Hi, I 'm planning my 25th anniversary Renewal of Vows for 7/2011. Our colors are going to be pewter gray,purple,and black. My dress will be a strapless bridesmaids dress from J Crew in gray. I hope this helps. My husband I Iwill be celebrating our 25th in August. We have 4 kids, all of which are college and under so they will not be in a position to put on our party. We are renewing our vows at our church and then having a dinner back at our home. We have rented a tent, tables and chairs, and then we are building a pallet dance floor. Doing the food and music our selves, with the help of family and friends. I bought just a nice dressy summer dress, my kids will have coordinating colors, and husband in shirt and tie. very cost effective but a relaxed atmosphere. We wanted to be able to spend time with our friends and family. My friend has requested that I help with the arrangements for her 25th wedding anniversary. She is expecting 300 guests and wants a sophisticated party. I want to make this a memorable event for her. Even though I have done this type of event before I am at a loss with regards to decorations, etc. Please help me asap. You should incorportate as many personal notes as you can about thier life together; such as having pictures of the two of them from when they first started through the present day in black and white throughout the hall. They could be the center pieces on the tables or hung on a wall in a collage. Another idea that incorporates thier life together would be to have different themes for different tables signifying different memories together, like a hawaiian themed table if they went there on thier honeymoon, and a table depicting where they first met, and so on. It would be very special and unique, and if done tastifully, still come across as sophisticated. I could really use some help! My parents 25th is coming up in about a month & I have no idea what to do. The thing is they've been talking about getting a divorce for about 6 months now. Nothing final yet but, it looks like they will. I'm pretty sure it won't happen for at least another 6 months. So I don't know if I should go ahead & throw them an Anniversary party or not. My Dad wants one but, he's always hated parties & Mom don't really want one & she's the one who likes parties somewhat. So any ideas on what I should do? I would NOT under these circumstances give a 25th Anniversary party!!! Save your money and when they get divorced take your mom out for something special that she and you can enjoy together. Invite her friends and have a happy girls day. As for your dad you could just plan a day doing something he and you can enjoy together. Keep it Simple. I want to give a surprise party to my parents on their anniversary. I want a dance theme based party which everyone can enjoy. Please anyone advise me some ideas. For a 25th wedding anniversary, you can play music that was popular 25 years ago, and decorate with old newspapers, or magazines from that day. You can put up a table with their wedding pictures, and a list of things from that year-such as popular girl and boys names, the #1 song the week they got married...... It is referred to as the Silver Wedding Anniversary, so decorate with some silver bows and such. Dont forget cake and punch. It would be fun if you had a cake made like the one they had. I am looking for ideas for a 25th wedding anniversary party. Lots of silver decorations. Play songs and have news articles from 25 years ago. Show their wedding pictures. Have food. Perhaps you can do a trivia game with the questions about things that happened 25 years ago. 25th anniversary is silver. I would decorate with hearts and pictures of the couple through the years. How far in advance do I start planning for my 25th wedding anniversary? My 25th anniversary is in July of this year. I have been planning since January 02 this year but founded out I should have started June last year because the dates I want in July are already booked. So start as soon as you can. I need inexpensive ideas to celebrate a 25th anniversary, gifts, food, and decor. You don't need a lot of decorations. Balloons, special paper plates and napkins, maybe one floral centerpiece. For food, sandwiches, cake, coffee, and punch would be enough. Unless you are having the party at somebody's home, you will also have to rent a place to have the event. It seems like the last few years people think they need tons of decorations for events. When we had my parents 50th anniversary after we rented the hall, we didn't do any decorating, we did have paper plates, and napkins, a guest book, etc. For food we had sandwiches that we made, our Mother even helped with that, cake, punch, coffee, and tea. The party itself was the gift us three kids, gave our parents. Things don't have to be expensive. For the sandwiches, we ground up bologna, and added mayo, diced onion, celery, and whatever seasonings we needed. The cake and the small buns were from the bakery, otherwise, we made the filling for the buns, and the coffee and punch. We want an anniversary party with a tight budget. Our anniversary is March 8, 2005. We are still very much in love. Even more than ever. I would like at least one slow dance with Alan Jackson's song "Remember When". Is there any suggestions you could give us without this getting out of our financial range? I look forward to your reply. Editor's Note: This was posted as feedback on a request for 25th anniversary ideas so I assume Marie is also looking for ideas for their 25th. Had a set number of invitations (it was 50 I believe) We made the invitations on the computer, used a single piece of paper and then "tri-fold" and used the back of the paper as an envelope. Had a sheetcake made by two of the sisters and I made one to feed the guests, I made a "fake cake" out of styrofoam circles and Laundry detergent flakes, using the original topper and that was the centerpiece. I made a bouteneer (sp?) for FIL and a Coursage for MIL. Other than that, the decorations were their wedding pictures and her dress/veil, as well as the fake cake. The only thing we splurged on was napkins that had their names on them, and the years. With the hall we rented, invites, stamps, decorations, and napkins, it all only came to about $125. Invitations were the pkg ones from WalMart, that were elegant but plain. I just made a couple sheet cakes that said Congrats and had the years on them, their original topper and wedding photo was the centerpiece for that table. We served coffee and tea for drinks. For the rest of the tables, I got a fluted "fish bowl" from the craft section at WalMart. I put on in the middle of every table, with "confetti" underneath. The bowl was decorated w/ribbons/pearls and a floating rose candle in the middle. We went ahead and again, splurged on the napkins that had their names and years. This one cost about $75 for us. I forgot to mention that these were come and go affairs, like from 2 pm - 4 pm. I would think that you could still implement many of these things in a more formal setting with a dance. I hope that some of these suggestions help and that you have a wonderful anniversary! For my parents' anniversary party, I want to give a gift, such as a basket of chocolates, with an invitation scroll, rather than a simple card. Please suggest to me some ideas. Looking for 25th wedding anniversary ideas for somewhat informal party. It will be hosted at our house versus facility. Looking for some creative and fun decorating and/or party favor ideas. Thanks! I was wondering what a child should play for their parents, specifically a son? I am in need of ideas for my parents 25th anniversary party. I am on a budget because my brothers and sisters are doing nothing to help me. The colors are of course silver and black. I do this kind of thing a lot but I am out of ideas. Thanks for your help. Hello, I don't know how many people you want to invite or what type of thing your family is into, but an idea is you could have a party where each guest has to perform an act for your parents, ie. can be anything, like a dance, or sing or magic tricks. As long as it is some kind of entertainment. You just ask the guests to bring their own music or instruments. We rented a very nice American Legion hall. Cost: free for members. We hired a caterer who did "drop-off catering". cost: about $5 per person. (That may sound like a lot, but if you add up all the stuff you'd buy, then cook, it was better for us) Instead of that, you could go to a warehouse club and buy large boxes of hors d'oevres that they sell frozen. If you buy enough, and serve beverages, it will be enough. Especially if you have an afternoon party. We made chocolate wedding bells and covered them in aluminum foil as favors. Molds cost around $1.49 each, and you can get melting chocolate at craft stores and grocery stores. We come from a boisterous, semi-theatrical family, so we had entertainment. We researched history over their 25 years together, wrote a speech that was chronological with highlights of personal, world and entertainment history, and for each decade involved, we chose a song that was popular at that time that meant something to them. During that song, some or all of us did a "lip-sync". For example, one song was by Sonny & Cher. I played Cher, and my nephew played Sonny by getting on his knees with shoes propped under his knees. We didn't go for accuracy in the lip syncs, more for laughs. That was a big hit. Cost: essentially free. I did buy some costumes; sequined gown for Cher, red and black jacket for a Michael Jackson song, but I went to thrift stores and got them for next to nothing. For the cake, my mother splurged and had a bakery re-create the wedding cake. But now Wal-Mart sells cakes (really cheap), and so do a lot of grocery stores. Or maybe you know someone who does cakes. Oh, and for centerpieces, I bought glass bowls, floated 3 white carnations tipped with silver, sprinkled silver confetti around the bowls, and used white votives in plain votive holders. I have also used the bowl idea in different ways. I've taken fabric, put it on the table flat, or also "poofed" around the bowls, and floated candles instead of flowers. Make sure you use unscented ones if you'll be serving food. I've also done the bowl thing with colored water and flowers and candles. Basically, think about your parents, not your siblings. Whatever you do for them, they will love. Do you have close aunts or uncles? Maybe they would like to help, or have some ideas. They would be a great source for pictures, too. Feel free to send me a message, we've had tons of parties and weddings, all on limited budgets.